Many people complain of lower back pain, but do not know the cause. While it can occur when a person pulls his/her back muscles or a muscular spasm, lower back pain can even occur when there kidney problem. Many kidney problems, such as kidney stones, kidney infection or acute renal failure, can result in pain in the lower back due to the location of the kidneys. If lower back pain is caused due to a kidney problem, it is imperative that the doctor get the diagnosis right to begin the treatment. Invariably, the person will also have other symptoms besides pain in the lower back. These symptoms could include fever, need to urinate frequently, bad odor from the urine, blood in the urine and having an upset stomach. If you are suffering from lower back pain, you can actually determine whether it is caused to an infection in the kidneys. The location of the pain is the best indicator, as the person will experience pain on either sides of the spine, in an area just above the hips. It is important to remember that the pain due to kidney infection or trauma actually emanates from the organ itself, but appears in the form of back pain. Furthermore, at times, the pain can radiate to other parts of the body, such as the hips or upper thighs. 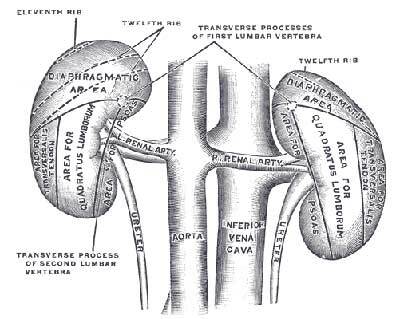 Once the infection is treated or the stone is removed from the kidney, the pain will disappear. Hence, seeking a doctor's advice is the best option for people who are suffering from lower back pain. It is also important to note that at times due to injury to the lower back, a person can experience pain that is similar to the pain caused by a kidney infection. In such a case, the pain does not worsen when the region of the kidney in the back is gently pushed. If this is the case, in all probability, the person is suffering from a trauma to the lower back. Also, if the person does not have associated kidney infection symptoms, such as fever, chills, pain while urinating and/or passing blood while urinating, it is not a kidney related pain. If a person has a family history of kidney problems and the lower back pain comes on without a reason, it is best to visit a doctor to get some tests done. These tests will allow the doctor to rule out kidney infection. It is better to be careful than to regret it later on. Kidneys are important organs of the body and are required to eliminate wastes and toxins from the body. If the kidneys do not function properly, these wastes and toxins will accumulate in the body and cause further health problems. Hence, lower back pain should never be ignored. Massage therapy is very valuable in treating back pain. Different techniques are used and it depends on the area and kind of pain. Massage helps to increase the blood flow to the affected area, and decreases the spasmodic pain. It also mobilizes the affected area without causing pain. With massage, the back can return to its normal function in a short period of time. More..